Ayelet Argaman is also a preferred hawt bixch. Image courtesy of PMC. Ayelet Argaman, an aspiring actress is suing her married former lover for allegedly trying to take back $3 million in gifts — including a Trump Palace love nest. In filed court papers the wannabe actress who has had bit parts in“Law & Order” and “The Sopranos” told how she embarked in an affair with her much older sugar daddy, Beachwold Residential President Robert Rothenberg, over a year ago. According to a report via the nypost, the 35 year old temptress told how Rothenberg, 55, wooed her by forwarding to her emails from rabbis praising the developer as a ‘charitable religious man’ and promising to get an album produced for the actress and fledgling singer. Brief pause, look out the window and wonder what makes the rosy world go round…. continuing. From there, Argaman tells in her suit how she then started dating her sugar daddy in September 2013, forwarding emails from Rothenberg where he reflected she ‘probably wants a younger version of me’ but coos that ‘God works in ways we don’t understand.’ Indeed. Ayelet Argaman, images via facebook. The suit also alleges that the real estate mogul whose company owns more than 10,000 apartment buildings across the United States showered Ayelet Argaman with $1.3 million in other gifts, including money to fund her entertainment career, luxury home furnishings and $100,000 a month for expenses. Brief pause. Look out the window. Where was Robert Rothenberg when I too was living in the dumps during my own heady days of pursuing an entertainment career? But alas things would soon get heady… and how. The aspiring actress would dump her sugar daddy in June, which in turn led to our married heart throb threatening to sue her (can you guess why? ), claiming New York’s ‘heart-balm statute’ requires her to return the gifts he gave her because they were made in contemplation of marriage. Not so tells Argaman whose lawyers have since argued that the law doesn’t apply in this case because Rothenberg was and still is married. ‘An adulterer like Rothenberg cannot invoke an exception to the heart-balm statute — which is intended for single people actually engaged to be married — which was never the case here,‘ her suit says. Rothenberg’s lawyer, Larry Hutcher, has since responded, insisting that many of the sugar baby’s allegations are not true. 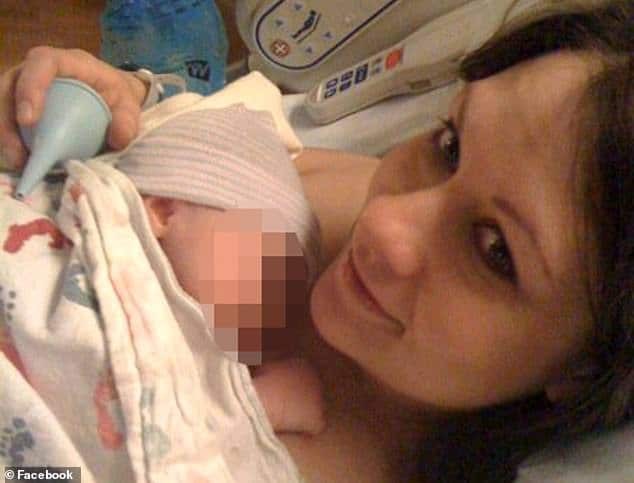 In fact the lawyer reckons his client had a temporary order of protection from Nassau County Family Court which prevented Argaman from contacting Rothenberg or his family. Why bother starring in Hollywood action flicks when you can create your own tabloid drama…? 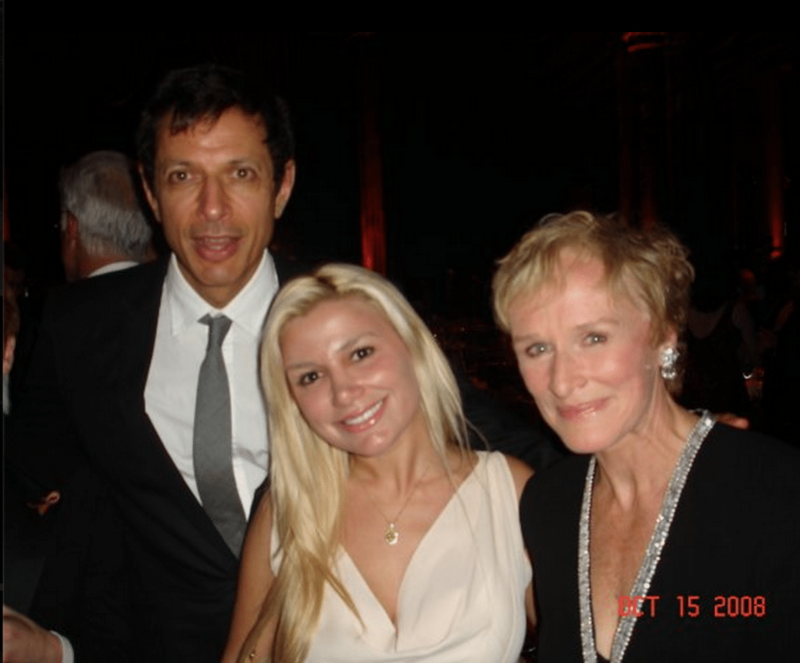 Ayelet Argaman seen here with some Hollywood power players, Jeff Goldblum and Glenn Close. 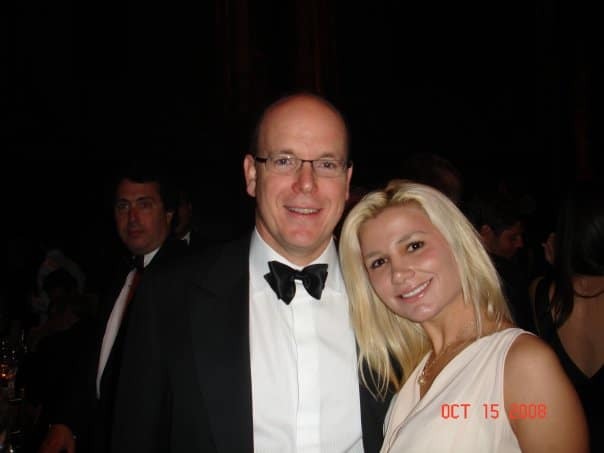 Ayelet Argaman with Prince Albert of Monaco….